The Mansions were designed by English architect George Addison and built in 1889. Addison’s firm Oakden, Addison and Kent had opened offices in Brisbane and Addison designed many notable buildings and houses around Brisbane and the surrounding districts, including the Albert St Uniting Church and the Strand Theatre in Toowoomba. The building was constructed by RE Burton at a cost of £11,700. Constructed of red brick in the ‘Queen Anne’ style, the building was well suited to the sub-tropical climate of Brisbane. The cats that sit on top of the building were crafted from New Zealand limestone. The building consists of six, three-story terrace houses, which were and remain an uncommon and distinct form of architecture in Queensland. Its large arcaded balconies, along with its corner position, provided pleasant conditions to the professionals who occupied the building. The Mansions were initially built as an investment property for three Queensland politicians – the Hon. Boyd Dunlop Morehead, Premier, the Hon. William Pattison, Treasurer, and the Hon. John Stevenson, then-member for Clermont. As the second of only two Australian-born Premiers up to that time, Morehead served in the Queensland Parliament for over 30 years. 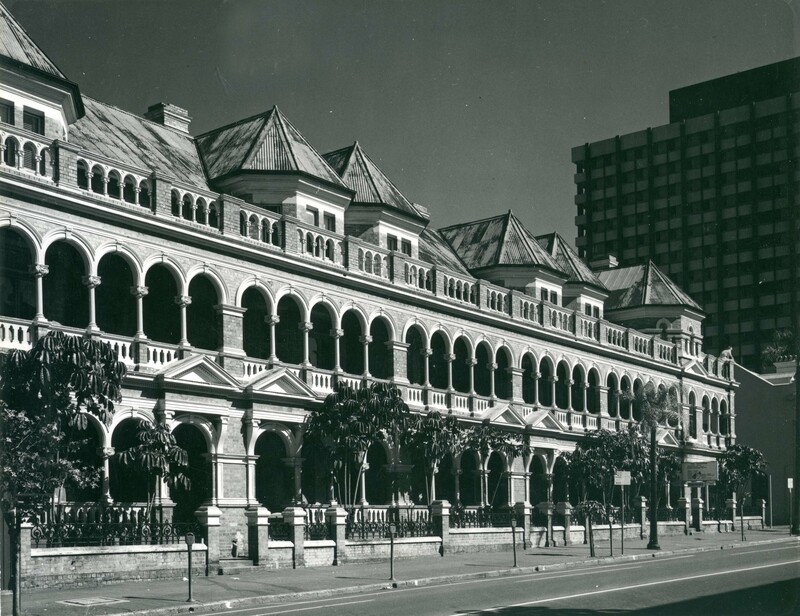 The addition of other buildings such as Government House and Parliament House contributed to the establishment of a ‘government precinct’ area in George Street. One of the most prominent figures of Queensland medical history, Dr Lilian Violet Cooper (1861-1947) emigrated to Brisbane and set up her medical practice in The Mansions in 1891. Dr Cooper advocated the health of women and children and in 1896, and became an Honorary Medical Officer of Outpatients at the Hospital for Sick Children, which was located in Leichhardt Street, Brisbane. This hospital later became the Royal Children’s Hospital. Between 1896 and 1954 The Mansions was divided into boarding houses, and in 1947 were named Lonsdale, Glenmore and Binna Burra. In 1954 the Queensland Government purchased the property, converting it into office space for a cost of £45,054. Government departments occupied the building during the 1970s included the Statistician’s Office, Medical Boards, Licensing Commission, Prices Branch, Department of Public Works and the Probation Office. Today, The Mansions houses professional offices and a restaurant.